Pope Francis has made an surprising prayer request that all the Faithful of the Church would pray daily the Holy Rosary and two other prayers for the entire month of October. The month of October has traditionally been designated as the "Month of the Holy Rosary" and many Catholics do make a special effort to pray the Rosary daily themselves or especially with family or friends. 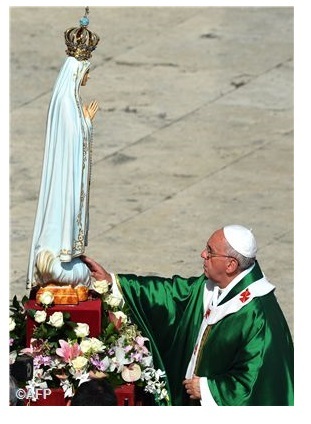 However, the Holy Father has asked that two other prayers be added as well. The two prayers are: the prayer to the Archangel Michael that was composed by Pope Francis' predecessor Pope Leo XIII in 1886. (It was suppressed in 1964, but now Pope Francis is asking that the Faithful begin praying it again); the second is a prayer well known to Ukrainian Catholics... To the Shelter of your mercy (Pid tvoju mylist') which most have prayed since childhood. The notices issued by Vatican News are given below both in English and Ukrainian. The additional prayers are also given below (other valid translations may vary slightly) and internet links are provided for the basic Rosary prayers for those who may want to refresh their practice. St. Michael the Archangel, defend us in battle. Be our defence against the wickedness and snares of the Devil. May God rebuke him, we humbly pray, and do thou, O Prince of the heavenly hosts, by the power of God, thrust into hell Satan, and all the evil spirits, who prowl about the world seeking the ruin of souls. Amen. Святий Михаїле, Архангеле, захищай нас у боротьбі: будь нашим захисником проти напастей і підступів диявольських. Покірно просимо, нехай Бог його подолає і Ти, о Князю Небесного Воїнства, Божою силою скинь у пекло сатану і злих духів, що блукають світом для знищення душ. Амінь.